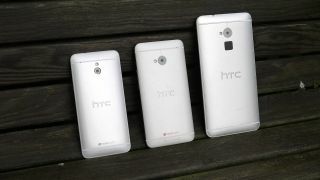 Can the old One-Two revive HTC's fortunes? HTC may have churned out some top handsets in the 2013, but the critical success of the HTC One range isn't translating into the big sales the company became accustomed to during the first Android boom. The company just posted its financial results for the last three years of 2013 and although HTC narrowly avoided a second consecutive quarterly loss, the figures do not make particularly pleasant reading. The company eked out a $10m (around £6.1m, AU$11.1m) net profit for the quarter, on revenue of $1.4 billion (about £850m, AU$1.15bn), Reuters reports, falling below the modest expectations. However, the firm only managed to stay in positive numbers but only due to sale of its remaining shares in Beats Audio, which netted the company a one-off payment of $85m (around £51m, AU$95m). The company's fall from grace has been marked by a sharp decline in sales as Samsung continues to dominate the Android handset market. Recent numbers suggest HTC now owns just a 2.2 per cent share of the smartphone market, down from 10.3 per cent two years ago and handset sales have now fallen in 9 successive quarters. The company has made various efforts to bring about change with the replacement of top executives and an expensive new advertising campaign starring Robert Downey Jnr, but it's made little difference. The launch of the highly-rated HTC One Max brought hope ahead of the Christmas sales period, but it appears the larger handset hasn't grabbed punters either. The Taiwanese company, now valued at just $4 billion, will now pin its hopes on the eagerly-anticipated sequel device the so-called HTC One-Two, which may arrive as soon as MWC next month.